If you’ve been hanging around with My Little Robins for awhile, you may have heard me make this analogy before. And, if you were a fourth grader in my class several years ago, you heard this analogy, too, that I made up to help you understand synaptic pruning and other concepts of habit training. I think this analogy is helpful, and I wanted to flesh out the similarities between habit training and walking in the snow. Today is a snow day for local schools, and we are celebrating it in our own way, with blanket forts and tea parties. Yesterday the air became frigid, dropping well below zero overnight, and layers of light, dry snow covered the ground. Our Wednesday plans were cancelled, and instead of staying inside, we braved the cold weather to play in the snow. I loaded all of the children into my car, complete with a sled, all of their snow gear, and a bundler for the baby. The park with a slightly sloping “sledding hill” is within walking distance, but little legs get extra tired walking in the snow. When we pulled into the parking lot, I searched for signs of others. There were no tire marks in the parking lot, no little footprints near the hill. A part of me was disappointed that we were the only ones enjoying this crystal blanket. What were all of the other children doing? Do other people think it’s too cold to be outside right now? I was sad that we were literally the only ones enjoying this beautiful, although cold, day. But there’s one thing that I always love about being the first one out in fresh snow. The untouched beauty of the white snow blanket. Knowing that no one else has set foot here today. I love it when we are the first feet to press down the powder. I watched as my toddler got out, a little unsure of his mother’s sanity for bringing him outside on such a day. He stayed by the car for a moment, then picked up his yellow boot high, holding it timidly above the fresh snow. He placed it down, hard, repeating the dramatic process several times. With over six inches of snow, each new step was hard-fought. The snow covered the top of his boots and I could see him thinking and planning each subsequent step carefully. He walked forward a bit, and then, gaining more confidence, walked in a circle, making a whimsical little loop of tiny boot prints. He saw me smiling at him, and then he turned around retracing his steps, this time more quickly, more confidently. He had already pressed the tracks into the ground, and this time it was much easier. Had he turned back to retrace his steps again, he would have sailed by at his fast toddler pace. And in my son’s exploration of the snow lies a secret of habit training. At first, we start off awkward and flailing. It is difficult to form a new habit, and it feels unnatural. We are, after all, fighting our nature. But, as we repeat the new habit again and again, it gets a little bit easier each time. We are no longer flailing, we begin sailing. 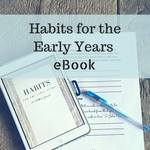 “For a habit is a delight in itself; poor human nature is conscious of the ease that it is to repeat the doing of anything without effort; and, therefore, the formation of a habit, the gradually lessening sense of effort in a given act, is pleasurable.” Home Education page 121 (affiliate link). The process that our brain undergoes during habit training is called synaptic pruning. We strengthen the synaptic connections between neurons when we practice a new habit, and we weaken the connections between our former way of doing things. Like the snowy path, repeating the steps only makes the pathways stronger and clearer. Those trudging, stumbling motions become fluent, our new nature. When you start to build a new habit, either for yourself or for your children, remember that it only gets easier. Remember that the unnatural, fighting piece of it is only temporary, until your brain, and your body, can catch on.